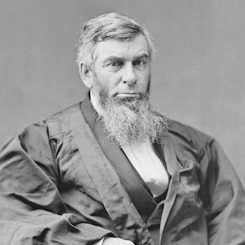 Image courtesy of Library of Congress Morrison Waite served as Chief Justice of the Supreme Court from 1874 until his death in 1888. On this date, the House of Representatives hosted a funeral to honor Chief Justice Morrison R. Waite. After the House resolved on March 26 to hold the funeral in the House Chamber, Congress passed S. 2494 to appropriate the sum of $5,000 to defer the cost of the funeral. Due to the great demand to attend, each Member of Congress was awarded two tickets for the House Gallery as well as one ticket for the House Floor. The Boston Daily Globe referred to tickets being sold for as much as five dollars. Funeral participants included the House of Representatives, the Senate, President and Mrs. Grover Cleveland, the Supreme Court Justices, the Cabinet, and the diplomatic corps. The House gaveled in at 11:30 and the Reverend J.H. Cuthbert of the District of Columbia provided the opening prayer. Speaker of the House, John Griffin Carlisle of Kentucky presided over the service and shared the rostrum with the President of the Senate. Immediately following the ceremony, a joint committee comprised of House and Senate Members accompanied the remains of the Chief Justice to the funeral train en route to his hometown of Toledo, Ohio. In its history, the House has held more than 30 funerals in the House Chamber. The last funeral in the House Chamber was held in 1940 for Speaker of the House William Bankhead of Alabama.